It's easy to tell what inspired this card, right? 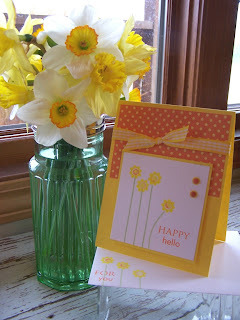 Yep, the beautiful bouquet of daffodils. They were calling my name yesterday from my flower bed. I absolutely love when spring time comes around and Mother Nature wakes up the earth. These daffodils were the first sign of spring at my house....oh and this beautiful Meadowlark that sings on my fence each day...and my blooming Bradford Pear trees. 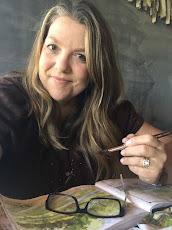 So if you need some new ideas, spring time offers a beautiful array of new colors, flowers, birds and much more to inspire your creative side. And don't just create those cards, mail them off to a friend. You don't need a reason to send a card! 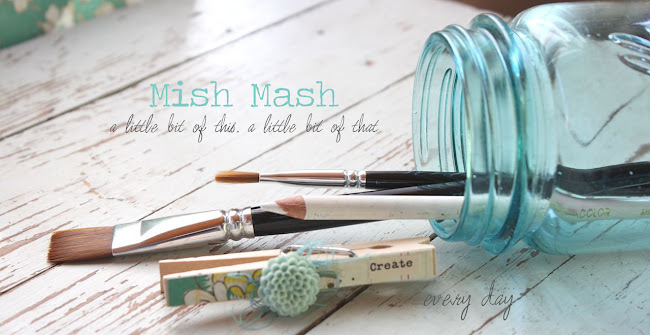 Tip of the day: Having a little trouble lining up acrylic words on your stamping block? Me too! Place the words inkable side down on your worksurface, the flat surface will be facing you. Then pick up the words with your clear, acrylic block. Go to the next word if you are creating a phrase. I found that this allows the words to lie straight while on the worksurface, instead of being applied wavy or crooked by hand. What's for supper, mama? How many times do you think we'll hear this in our lifetime? A million more, I hope! Another one of my favorite hobbies is cooking and menu planning. I know, a lot of you are thinking *ick, I hate to cook*. But I love it! My mother and grandmothers were cooks and gardeners and we were always picking, stemming, canning and cooking everything in sight. It was a great time for me back in those days. Today, I still love to do all those things and have been passing along my secrets to my two girls who love to cook as well. So this morning I whipped up this vintage style clipboard to house my recipes and weekly menus. Now sometimes that weekly menu consists of Hot Pockets and Lunchables so don't go thinking I'm Martha Stewart! I'm more like Sandra Lee of Semi-Homemade Cooking! She's on the Food Network Channel. Anyway, I digress often so bear with me. 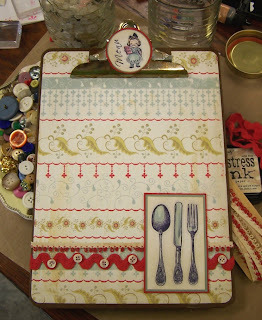 This clipboard is embellished with my favorite new paper from Cosmo Cricket, which you can purchase at Eclectic Paperie(link at right). I rounded the corners mod podged it to the clipboard. The wonderful vintage stamped embellishments are from a set called Kitchen Classics from Crafty Secrets(Sweet Miss Daisy sells these now). I am in love with their new line of vintage images. The bird set is next on my list! To tone down the shiny silver metal of the clipboard, I dabbed on some tan colored alcohol ink. My friend Cindy will be so proud, she is the queen of alcohol inks! The ric rac is new from my LSS and the vintage loopy ribbon came from a box of junk that my local Senior Center donated to me, what a find! Well, I'm off to go put some recipes in my clipboard. I hope you enjoy it, and go cook something with your kids today! Tip of the day: Do you have difficulty in shading while watercoloring images? Let your stamped images guide you. Look for those little shaded lines, like in the utensils on my clipboard. Those are shadow lines. Color those areas darker. The areas that are left white are highlighted areas. Make those areas a lighter color. Leaving an area white in those areas is also very pleasing to the eye. It's Monday! What can I say...back to sub after 9 days of sleeping in over Spring Break. Ug. I have burning, puffy eyes and coffee breath! Let's hope that my makeup, freshly pressed outfit and mints disguise my inner self today! LOL...it's bound to get better right? These cards use up another sheet of my one sheet wonders that I did over the weekend. 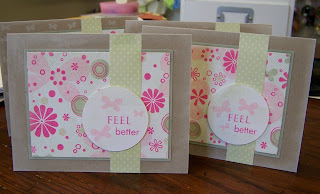 I wanted a very soft and subtle feel for these get well cards so I used white pigment ink to sponge all the edges. The background is made with a SU! jumbo wheel, and the butterfly images and sentiments are from Paper Trey Ink, linked at the right. Card layout inspired by a card in the current issue of Paper Crafts magazine. Tip of the day: If you have favorite patterned papers that you can't bear to part with, purchase two sheets. Hoard one if you must, then use small snippets from the other sheet, like what I did with the green polka dot paper. It makes your paper go a long way. Oh, and go back to bed!